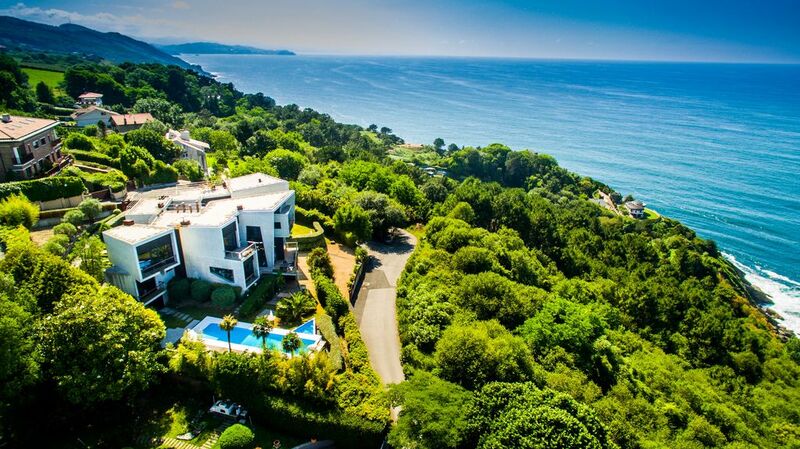 Luxury villa with an area of ​​1000 square meters is located in the exclusive district of San Sebastian (Spain). Unique architecture, panoramic views of the ocean, exotic garden, 7 bedrooms, sauna, swimming pool, jacuzzi, gym and terrace. The villa is suitable for 13 guests. Just a few houses in San Sebastian can be compared with the proposed location for the villa, the comfort and privacy of private life. It offers a circular view of the Atlantic Ocean, turns into a truly theatrical sunset of extraordinary beauty in the evening. Such famous architects in Spain as Alejandro Peña and Juan José Arrizabalaga created an impressive and majestic design of the villa. Luxury house in modern style has all the amenities. The elegant interior is open plan with the large sliding doors that open onto a terrace. The terrace is equipped with a barbecue area to enjoy fresh air. Villa "sits" on the mountain, surrounded by an exotic tropical garden (olive trees, cork trees, palm trees and a variety of rare shrubs and flowers). There is a large swimming pool with counter current near the villa. On the first level of the villa there is a sauna and jacuzzi with panoramic views of the sea and the pool with the "illusion overflow into the sea." Next is a lounge with dining area and kitchen. On the same level there is a large gym. At the middle level of the villa: a large open living room and kitchen overlooking the shaded terrace with a dining table - a summer dining room. Barbecue is located next. Also, at this level of the villa offers a bedroom with a double bed and a bathroom with a shower cabin. Three bedrooms with private bathrooms are located on the upper level of house. The bedrooms have access to the outdoor terraces and balconies with beautiful views of the pool and the sea. In the second part of the villa there is an open living room, dining room and kitchen excurrent onto a terrace overlooking the sea. As well as three bedrooms with private bathrooms and showers. The perfect place to enjoy a meal in the dining room or on the outdoor sun terrace, swim in their own pool or on a sun lounger, to arrange an afternoon siesta in a spacious bedroom, or just relax on the soft white cushions, inhaling the salty air. First impression when you walk in is "wow!" This quiet and spacious home has stunning views from just about every room and is perfect for a large family or group. While it is a bit removed from town, everything you may need is just a short drive down hill, but in a house this lovely, you may not want to leave. Alexey and his wife were very responsive to their questions and problems and came promptly. The pictures on Home Away mostly showed the exterior with views, and the common areas. The four bedrooms in the main house are accessible by elevator, which was good, but the annex bedrooms are only accessible by stairs, and one couple had to climb 3 flights of stairs. All 3 of the showers in the annex had flooding at one point or were clogged.. In the main house, nobody knew how to use the TV or appliances. It would be helpful to have a set of instructions in English so they could be used. There should have been more supplies in the kitchen, like plates for that many people. There should have been trash cans in all of the bathrooms. The house should never be rented to families with children, as it felt like there are many safety hazards due to the design and concrete which is all over. They felt that children could easily fall from one level to the next. The views were spectacular and the group, which came from different countries, had a great time, but they could not stay at the villa again. Spectacular villa, quiet area, great for families. 3 Norwegians families (6adults/8kids age 3-12) last week of July 2018. What a house - Enjoyed every minute of it! Nice area for cycling and running - and then you can finish of in the gym. Very quiet and private area, but you do need a car. Lovely views and sunsets. San Sebastian is less than 10min away with a car. Alexey answers very quickly and was very helpful when we had questions or when we needed assistence.